Social facilitation can be defined as ‘an improvement in performance produced by the mere presence of others’. There are two types of social facilitation: co-action effects and audience effect. Studies on social facilitation concern the extent to which a given piece of an individual's behavior is affected by the real, imagined or implied presence of others. Perhaps the first social psychology laboratory experiment was undertaken in this area by Norman Triplett in 1898. In his research on the speed records of cyclists, he noticed that racing against each other rather than against the clock alone increased the cyclists' speeds. He attempted to duplicate this under laboratory conditions using children and fishing reels. There were two conditions: the child alone and children in pairs but working alone. Their task was to wind in a given amount of fishing line and Triplett reports that many children worked faster in the presence of a partner doing the same task. Triplett's experiments demonstrate the co-action effect, a phenomenon whereby increased task performance comes about by the mere presence of others doing the same task. The co-action effect may come into operation if you find that you work well in a library in preference to working at home where it is equally quiet (and so on). Other co-action effect studies include Chen (1937) who observed that worker ants will dig more than three times as much sand per ant when working (non-co-operatively) alongside other ants than when working alone and Platt, Yaksh and Darby (1967) found that animals will eat more of their food if there are others of their species present. Social facilitation occurs not only in the presence of a co-actor but also in the presence of a passive spectator/audience. This is known as the audience effect, surprisingly. Dashiell (1935) found that the presence of an audience facilitated subjects' multiplication performance by increasing the number of simple multiplications completed. Travis (1925) found that well-trained subjects were better at a psychomotor task (pursuit rotor) in front of spectators. However, Pessin (1933) found an opposite audience effect, namely that subjects needed fewer trials at learning a list of nonsense words when on their own than when in front of an audience. It seems, then, that the extent of social facilitation or inhibition depends upon the nature of the interaction between the task and the performer. In some cases the presence of co-actors/audience improved the quality of performance (Dashiell 1935) but in others it impaired the quality (though it increased the quantity of, say, multiplications). According to Cottrell (1968), it’s not the presence of other people that is important for social facilitation to occur but the apprehension about being evaluated by them. We know that approval and disapproval are often dependent on others’ evaluations and so the presence of others triggers an acquired arousal drive based on evaluation anxiety. Chen, S. C. (1937). The leaders and followers among the ants in nest-building. Physiological Zoology, 10(4), 437-455. Cottrell, N. B., Wack, D. L., Sekerak, G. J., & Rittle, R. H. (1968). Social facilitation of dominant responses by the presence of an audience and the mere presence of others. Journal of personality and social psychology, 9(3), 245. Dashiell, J. F. (1935). Experimental studies of the influence of social situations on the behavior of individual human adults. Pessin, J. (1933). The comparative effects of social and mechanical stimulation on memorizing. The American Journal of Psychology, 45(2), 263-270. PLATT, J. J., YAKSH, T., & DARBY, C. L. (1967). Social facilitation of eating behavior in armadillos. Psychological Reports, 20(3c), 1136-1136. Travis, L. E. (1925). The effect of a small audience upon eye-hand coordination. The Journal of Abnormal and Social Psychology, 20(2), 142. Triplett, N. (1898). The dynamogenic factors in pacemaking and competition. The American journal of psychology, 9(4), 507-533. MLA (Modern Language Association)"Social Facilitation: Drive Theory, Evaluation Apprehension, Distraction Conflict." 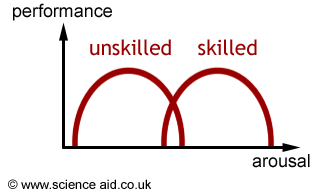 ScienceAid, scienceaid.net/psychology/social/facilitation.html Accessed 11 Mar 2018. Chicago / TurabianScienceAid.net. "Social Facilitation: Drive Theory, Evaluation Apprehension, Distraction Conflict." Accessed Mar 11, 2018. https://scienceaid.net/psychology/social/facilitation.html.